I am officially starting to feel consistently sore from working out. I wasn't doing it consistently or hard enough to feel this before, but it makes me feel ambivalent. The positive: something (not sure what) is happening and that I'm on my way to progress. The negative: things that were a breeze for me before are causing days of soreness, meaning that I've fallen off the wagon... and the wagon backed up and made a second round. I've been trying to stretch, eat more protein, and better things in general, though it's a work in progress. 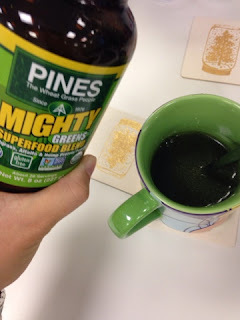 For example, I've had this bottle of greens at my desk forever, and I finally started drinking it. It tastes okay, pretty grassy and a tiny bit sweet due to Stevia, and I think I need some time to work up to the full teaspoon dose. Still, it's a great way to start off the morning and the virtue of greens keeps me from diving into something totally unhealthy for breakfast. USDA Organic, Non-GMO Project Verified, RAW, Gluten-Free, OU Kosher. Harvested at the optimum growth stage, below 10” tall (jointing stage), to ensure the highest nutrient levels (many other competitors offer “flag grass” which is harvested after the jointing stage and literally drained of its nutritional content). Grown in mineral-rich glacial soil using natural rainwater – NOT irrigation water, which can be contaminated with non-organic farm chemicals and animal waste. The only wholefood wheatgrass producer to use stainless steel milling equipment resulting in an extremely clean product. The only wheatgrass superfood packaged in oxygen-free, amber glass bottles with specially designed metal caps to remove oxygen and provide food as fresh as the day it was made. ONLY Non-GMO Project Verified Alfalfa current available anywhere! Anyway, I bet you're wondering what I've been doing that has been making me sore, and the short answer is, pretty much everything from 2/3 mile runs, Insanity, squats, the ab machine... everything. I remember walking at the zoo with Baby Tuesday in the carrier, and even THAT did it. Okay, so it was a hilly zoo, but still. FTC Disclaimer: I was sent a sample of this product and was not otherwise compensated to provide a positive review. I've always wanted to try Insanity. It sounds really tough. I'm sure it's nothing for you! Those workouts have always been not a cake-walk, but nowadays, they are even MORE rough! Hooray for progress! If you want a bit of moral support, I'm trying to get back to running 5 weeks postpartum. I hear ya on having limited time to work out. Have you got any specific goals in mind? I'd like to get back to pre-pregnancy paces and do a 10K and half in the next year. Those are great goals! I ran for the first time 4 weeks postpartum but I think I am finally starting to get back into a pace that was normal for me before. It's so hard to find time!! As for goals, I originally thought about running a half this fall, but the thought of waking up early and all is not appealing after months and months of sleep deprivation (hope your baby is a better sleeper!). I think I just want to increase my fitness in a general sense for now and work out most days a week!